Right after checking into our hotel, we took a walk to the beach about a kilometer away. The day was pleasant and there were not many people at Calangute beach during noon, but I was appalled to see the glass pieces from broken beer bottles strewn all over. One wonders when the Indian travelers will develop some civic sense. Anyway, that is for another day. We were hungry as hell and headed for Infantaria, a recommended restaurant in the market. Infantaria was already buzzing. We had heard about the breakfast here, but it was well past the time. 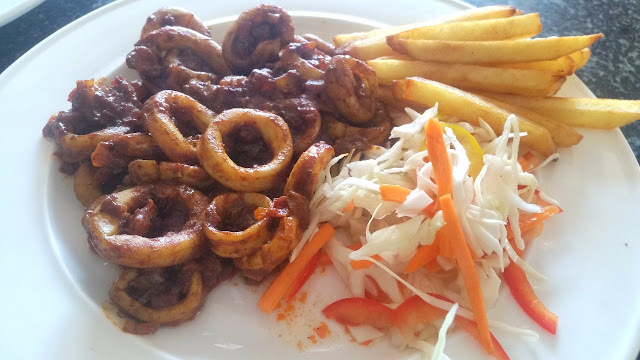 Since one of my attractions of coming to Goa is the seafood – you get a variety of fresh stuff - we settled for some Prawn Butter Garlic and Calamari Recheado along with some local Kings beer. 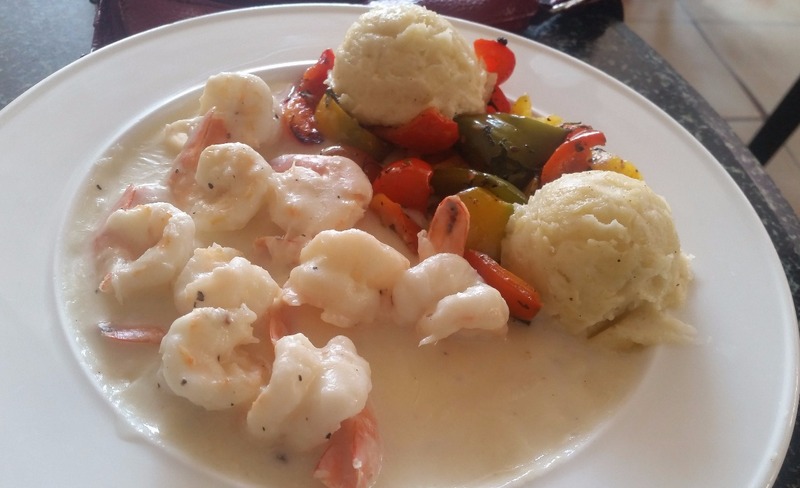 The prawns were served with mashed potatoes and sauteed veggies on the side and the butter garlic sauce was thick and finger-licking good. 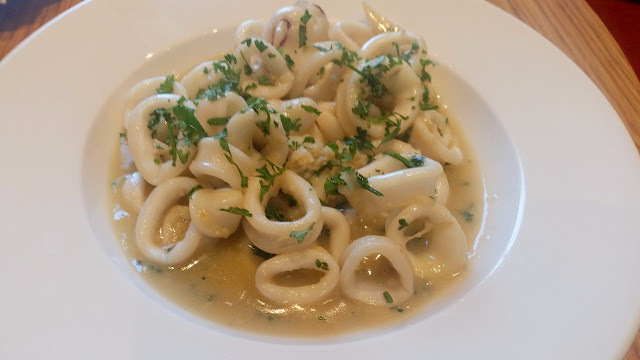 The calamari was fresh and not rubbery at all, and the flavourful and spicy recheado sauce had more than a hint of chillies, tamarind, and garlic. I was impressed with both the dishes. 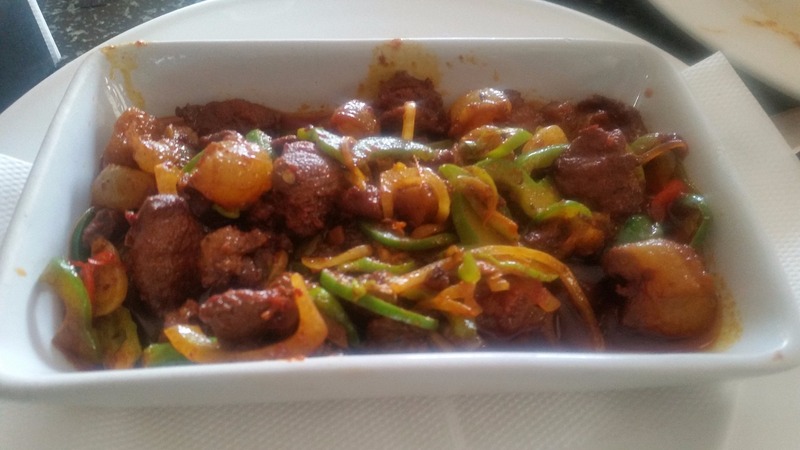 We next ordered some Goan Sausage Chilli Fry. Though I love tangy food, this was way too sour in taste. The sausages too were a bit chewy. Once good thing was that it needed a couple of extra beers to be downed with. Infantaria makes some delicious local pastries too. My wife had a few and packed some for our hotel. In the evening, as we walked down to the beach again, we noticed Escapade, a restaurant with a huge al-fresco seating overlooking the sea. 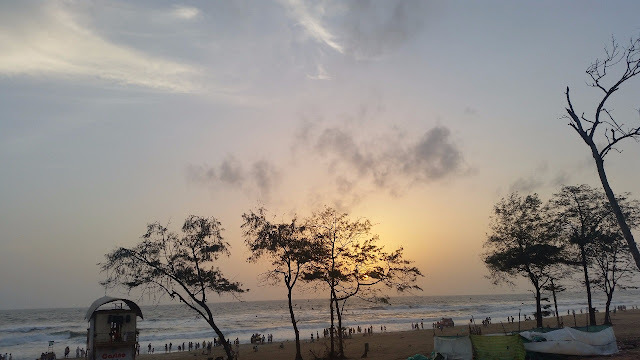 It is easily the vantage point to enjoy the sunset at the crowded Calangute. The food was nothing to write home about. 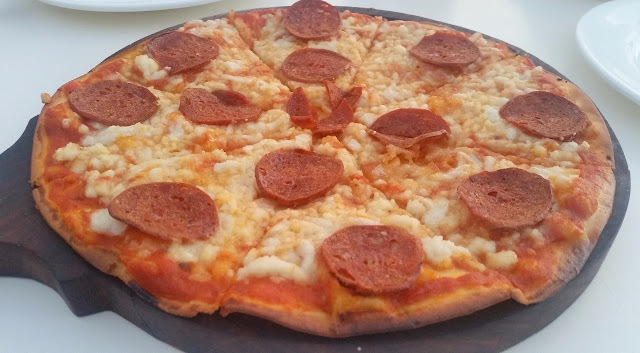 We tried a Pepperoni Pizza, which was very average with poor quality tasteless cheese. Service was poor too, but we actually did not mind waiting for the food as you can continue to enjoy the fantastic view from the restaurant. Our hotel was a new property – Ibis Styles Goa had started operations only a few months back. In the evening, I decided to go down to SpiceIt, the all-day dining restaurant at the hotel. The nice and cozy place had a compact menu with quite a few items from Goan cuisine. On advice from the chef, I ordered Butter Garlic Calamari and Chicken Cafrael. 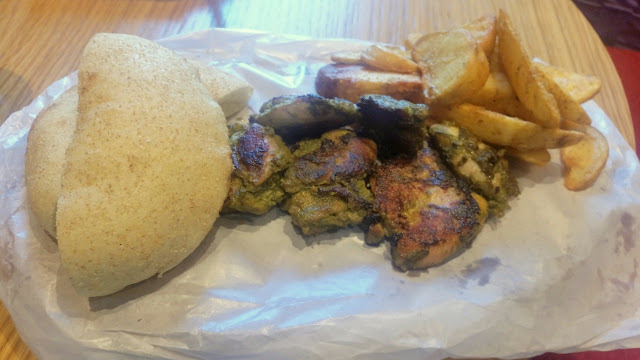 The green cafrael was served with Poi, the well-known Goan bread as well as French fries. The marinade had the flavour of fresh coriander leaves and green chillies. The squid preparation was a disappointment though. The sauce was dilute, low on butter and bereft of any flavour of garlic. The next day we took the walk down the seashore – from Calangute all the way to Baga beach. We passed a number of shacks and the famous Tito’s area, and finally reached Britto’s Bar & Restaurant at the end of the stretch. For those who are not familiar, the restaurant is bang on the beach. Live music was on, and the place was almost completely full. With a bit of good luck, we grabbed a table next to the beach. 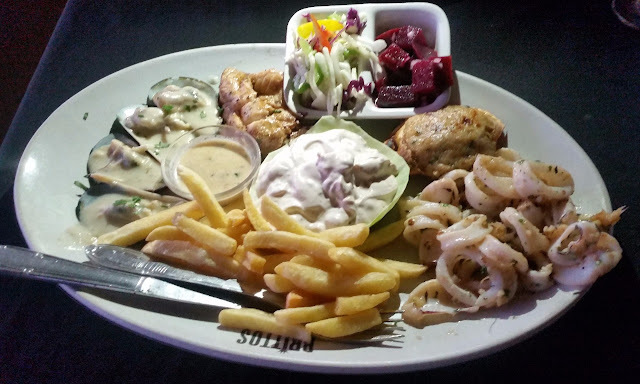 Britto’s is known for its Sea Food Platter and we lost no time in ordering it. The humongous platter has almost everything you want – prawns, squids, mussels, crabs, and fish. The baked crab was easily the best – the shell was filled with crab meat with mashed potatoes and butter. Prawn cocktail was another highlight, while mussels in white wine were for the more adventurous among the seafood lovers. Britto’s also serves some delicious Goan pastries which are displayed at a counter close to the entrance. I could not help ogling at the fresh seafood displayed in another counter next to it. On the last day, our dinner was at the redoubtable Souza Lobo. 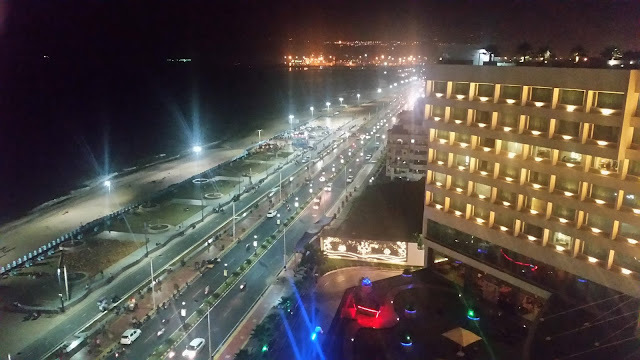 You cannot miss this place as it is prominent on the Calangute seafront. I had been here before and wanted my wife to try out the fresh seafood. Souza Lobo is known for its exotic Goan dishes like Pork Sorpotel, Goan Sausages, and Baked Crab. Roasted Beef Tongue is another delicacy here. We went for two dishes – Baked Crab and King Fish Peri Peri Steak. 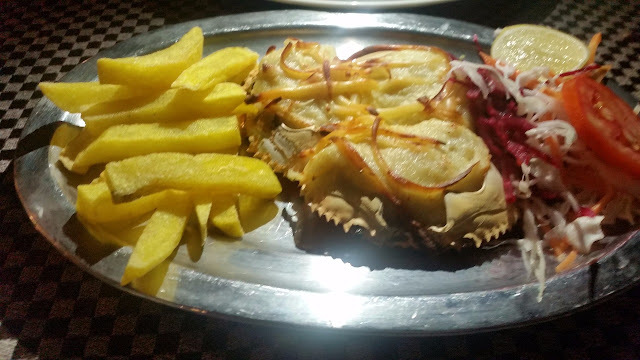 The Baked Crab served with French fries and salads was low on crab meat – the one served at Britto’s the day before was far better. The King Fish Steak Peri Peri, however, took away all my misgivings. 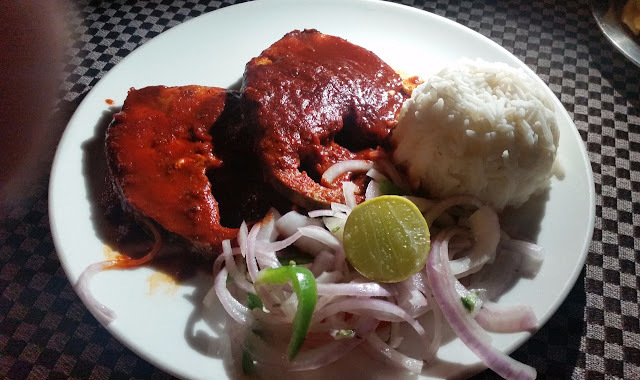 A huge portion of fresh fish served in a sauce of red chillies, vinegar and spices had a very balanced taste. The rice served with this was a perfect companion. 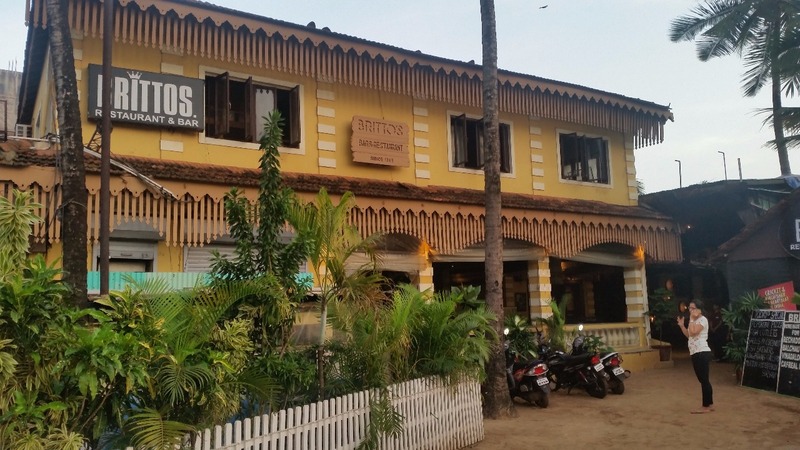 We had some more restaurants in Calangute on our wish list. Prominent among them were Café Sussegado, Fat Fish as well as Sai Prasad for the Goan thali. However, paucity of time did not allow us to try these places. So, we had to keep these pending for our future trips to North Goa. Note: Calangute is one of the most popular beaches in North Goa. It is about 15 km from Panjim, the capital of Goa and 40 km from Dabolim airport.